Keystone cuts in massive blocks weighing up to 200 tons. What pains were taken to secure these megaliths, as protectors of the sky temples, from ruin? At Puma Punku and Ollantaytambu T-shapes have been cut into the giant stone blocks at the point where one block corners another. 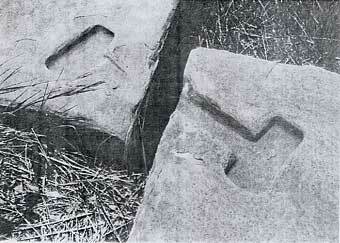 Obviously a metal clasp was once fashioned at these points to hold the stone blocks together. Again, it could not have been a gold clasp, it would have been to weak to have any effect, (and we know he megalith builders were effective!) and it could not have been put there by the Incas at some later date.